I woke up and checked out of the Manhattan Club hotel and ready to have a full and productive buying day for my Bethesda boutique. I normally check my luggage at the luggage check at Penn Station, NY. That way, I can grab my luggage and catch a cab for the airport. For some reason I decided to keep it at the hotel check for the day. That turned out to be a smart move. I then decided to walk to the Garment district. It was a beautiful day. It was sunny and in the high 70’s. As I walked through Time Square in the early morning I saw a disturbing thing on the Time Square screen – it was what looked like a bombing of one of the Twin Towers. I saw smoke and said to myself, “Oh no, they bombed the Twin Tower again!” What I didn’t see is the rest of that horrible incident of the Towers falling. Later, that view would be etched into my memory of that day. I arrived at my first appointment. “Did you hear what happened?” “No”, I replied. One of the Twin Towers has collapsed’, said the merchandise representative. They didn’t have a TV but turned on the radio. I was in disbelief. This couldn’t be happening! As a task oriented business owner who only had a day to do her work to support her business (I was a single business owner where the store was everything to me) I was kind of annoyed by the disruption. I hadn’t yet grasped the gravity of this day. People were calling their family members and checking on their kids at school. People were trying to figure out how to get home to their loved ones. I trudged onto my next appointment. I got to the next showroom. “Did you hear what happened?”, said the rep, “The second twin tower went down too!” “This has to be a hoax or something” I thought. “You’d better call someone”, she recommended. I called Alan and told him that I was alright. My mom was in London. I didn’t know how to get to her. “They cancelled all the flights and trains today leaving New York City”. Great! I needed to get home and had planned to fly home that evening. Late morning I was at another showroom. I realized I was not going to get home tonight and had to find a place to stay. I called the Manhattan Club. “Sorry we are full tonight”. I heard the only hotel room was in Edison, NJ. There were no cabs since those who left New York could not come back (People were paying cabs $500 to take them home!). They closed off the bridges. Fortunately, one of the Reps was a single gal and she said I could stay with her that evening in her apartment. I was relieved. I was able to use her computer to email my Mother to tell her I was okay. The cell towers went down and I got a phone call to Alan to tell him I was okay. Alan was going to call my friend Margie to have her feed my cat an extra day. Also, I was having trouble calling Amtrack and getting through. It looked like the train was what I had to take to get home the next day. I walked up 7th Avenue back to the Manhattan Club to get my luggage. If I had left it at Penn Station, they would not have let me in to get it. The walk uptown was surreal. When I passed through Times Square there was a calm and quiet. There were very few cars or cabs. I ended up buying a small radio with ear plugs so I could know what was going on at one of many of the electronic stores in Times Square. I arrived at my friend’s apartment. She had her sister there with her. She was generous and let me use the computer to get in touch with Alan to keep him updated. The phone circuits were all busy. There was a feeling that we were all in this together. We went for a jog in Central Park together that afternoon. Everyone was out in this picture perfect day but just in a somber mood. We went to an area restaurant for dinner and saw on the TV the president’s message. I found out that the Pentagon was a target too! My friend Gary worked there. My car was at the airport so when I came in from the train, I needed to be get back to the airport to pick it up. Alan said he would pick me up at Union Station in DC. I just need to give him the time. What I realized was that he was the kind of guy that I could depend on in times of emergency. Isn’t that what marriage is all about? Being there for each other in good times and bad? Having that someone be your support person. This experience made me feel closer to Alan and moved us towards seriously thinking about the possibility of marriage. If you are in a relationship, has there been any family or personal emergencies that have tested the strength of your relationship? Do you know if that person will be there for you in stressful times? And how can you tell if your partner deals head on with adversity or runs away from it? In my first marriage, this was never tested so I didn’t know that my ex had trouble dealing with the tough stuff! PS. If you live in the DC area and you are marriage minded, join my Meetup Group at http://budurl.com/DCMMGroup. Meet other marriage minded singles for friendship and dating! We have a meetup scheduled for 9/22 in Rockville, MD. 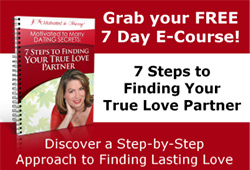 For those outside of the DC area, sign up on my Facebook page at www.facebook.com/marriagemindedsinglesdeclared Get Your free copy of my Motivated to Marry e-book there.